The training program for agricultural specialists who are knowledgeable about food (production?) and food (production?) specialists who are knowledgeable about agriculture will be handled by the Food Production Project Applied Training Program. Having been separate until now, agriculture and food (production?) will be parts of an applied training program whose goal is to produce people in Niigata who can deal with the problems faced in both agriculture and food (production? ), and facilitate understanding in both fields. Niigata prefecture, as known by many for its delicious rice and 'sake', houses many food-related industries, and is advanced in food business. In this especial location, our graduate school has programs to foster two types of specialists: one on sustainable agricultural technology, and for the other on agricultural research and development. We would like to offer programs for training professionals who are educated both in "agriculture" and "food" sector. The core of the program is "Niigata Food Project" in which students will experience the entire process of food promotion: seeding, cultivating, harvesting, and marketing food products with collaboration with local business. In the first phase of the doctoral program, students will take a part in "Applied Experience in Food Promotion" program. In the last phase of the doctoral program, students will take a part in a program called "Research Proposal in Food Promotion", where they will be involved in the entire process of food production from product management and marketing. Current program offers both scientific research training and hands-on experience to agriculture and food sector to train a true specialist. We hope many inspiring students will take a part in our program. Our department consists of many different academic programs: math, biology, physics, chemistry, mechanical engineering, electronics, information technology, architecture, agricultural production, applied biochemistry, science, and engineering. Our doctoral program consists of two curricula; first and second phase. In response to a recent push toward making graduate education more specialized and more applied, we have founded Education Research Specialization Center to help implement policies to make higher education more applied and global. 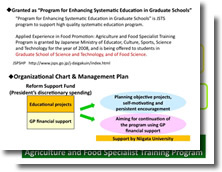 Since last year, we started a graduate education GP , "Agriculture and Food Specialist Training Program." This year, two new projects "Specializing Graduate Education by Global Circus" and "Training Human Resources for Innovation" granted by the Japanese government. I sincerely hope that our graduates will contribute, both locally and globally, as a researcher or a food specialist. 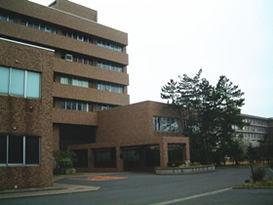 Copyright(C) Niigata University,All Rights Reserved.